After downsizing to a small Victorian terraced house from a five-bedroom property, Judith Meager was keen to create more room. 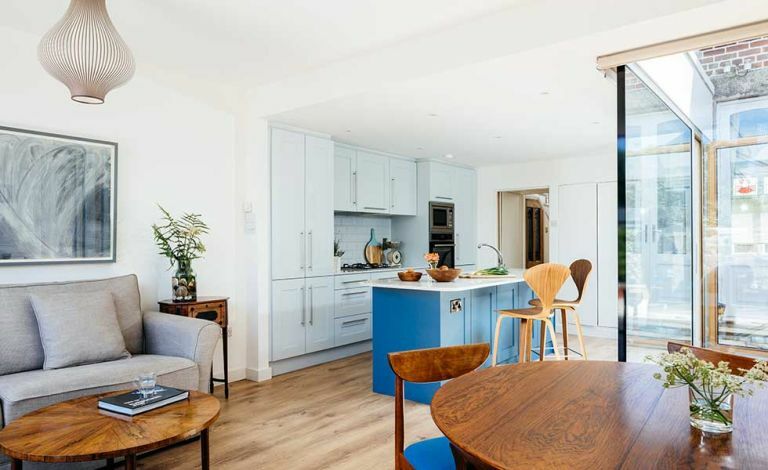 As the kitchen was dark with little worktop space, and the garden was a good size, she knew it would be right to replace the old unattractive lean-to, with a single storey extension out into the garden and to the side to create an open-plan kitchen diner. Love this? See all our real home transformations and extensions. Judith turned to architect David Leyden to come up with a design. She wanted to retain the period features of the existing reception rooms, while adding a large, sociable space that incorporated a kitchen, dining and living area, while looking out onto the garden.